The population of Vancouver is 46.2% European Canadian. Those of English, Irish and Scottish origins were historically the largest ethnic group in Vancouver, and this is still visible in areas like Kerrisdale and South Granville. Germans are the second-largest European group, followed by the Chinese, who are the largest visible ethnic group. Ethnic neighborhoods in Vancouver include Chinatown, Little Italy, Greektown and Punjabi Market. German is among the ten most-spoken languages worldwide, one of the working languages of the United Nations, and an official language of the European Community. The study of German is intended for all learners and offers lifelong enjoyment and a broad range of career opportunities. Learning German also enhances the learning of first and additional languages. It fosters the appreciation of traditional and contemporary cultures and positive attitudes toward cultural diversity and commonality. The government’s tourism marketing agency, Destination BC, works with tourism stakeholders throughout the province to market British Columbia as a world-class tourist destination. There is no German town! German-related businesses are just small islands in a larger sea. But I do have the dream to start a German Community Centre/Library/Museum/Gourmet Bakery somewhere in Metro Vancouver one day. We just need that “friendly German billionaire” who likes the idea of supporting this project. Let’s pretend we have a German Cultural Hall known as the “German Haus” right in Vancouver. Swiss practice Herzog & de Meuron have released revised plans for the Museum of the 20th Century project in Berlin‘s Cultural Forum. Designed to house the extensive National Gallery on 20th century art collection, the project was made in partnership with the Berlin State Museums and the Prussian Cultural Heritage Foundation. 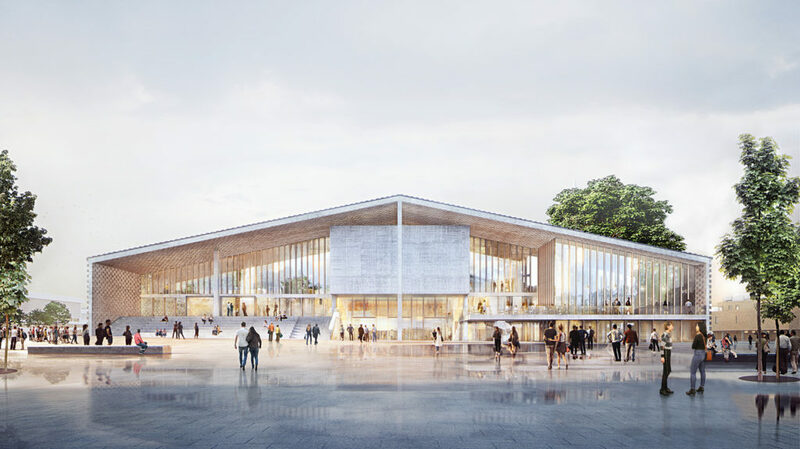 Herzog & de Meuron originally won the competition to design the museum building in 2016, and the revised design features new plans and a facade that opens the building to the outside. The reason I posted it here, is because I like this idea of having a German Cultural Centre/Museum/Library/Cafe that looks like this, with some inside spaces dedicated to modern and historical German spaces. Maybe a German bar with a hut inside, along with an indoor picnic space, as well as an outdoor space. The challenge with this design is the rooftop beer garden, but maybe it could still work with some revision.